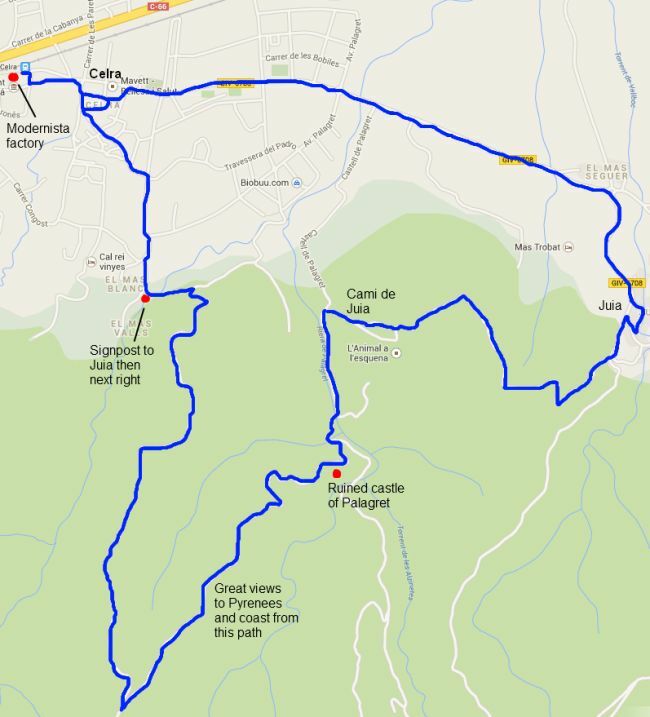 Travelling from Girona to La Bisbal on the C66 route to the Costa Brava, the road and railway line passes through Celra, Bordils and then to Flaça. From the main road, the towns look as if they are just a line of houses and shops built along the road and so seem quite plain motor suburbs for Girona. In fact, as with many towns in Catalonia, the view from the main road is deceptive. All of the towns are actually based around much older village centres, but each centre itself is around one to two kilometres away from the main road and away from the Barri d'Estacio - the estates, modern buildings and industrial units located close to the train station. For instance, many people who catch the train to Flaça to connect to the Costa Brava don't realise that there is actually an older and more interesting part to the town which is separate from the main station area. We mentioned Celra's modernista factory in our walk around Sant Julia de Ramos and we'd not visited Juia before this weekend, so it was a chance to explore up into a different part of the Gavarres, so needing to be in Bordils for a sports tournament we decided to take the opportunity to explore Celra and Juia. We parked and started in Celra just by the station and the old modernista factory. 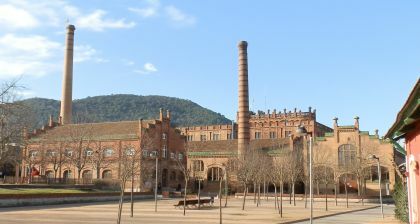 The factory itself (La Fabrica) is built in red brick with large windows and two old chimneys and is reminiscent of the harbour buildings on Gloucester old docks. It was a chemicals factory in the past originally for chemicals for the tanning industry, but it's now been coverted into a social centre, town library, and is also the location of an outdoor municipal swimming pool. We walked from the station up towards the old town and into the nucleas of older buildings just along from the town theatre - a building in an 1930s style, so probably from that time. 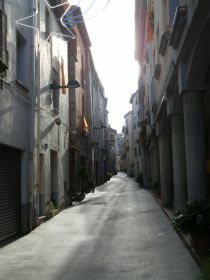 The inner part of the town is much older with stone built buildings along narrow streets that curl around to the church. The older part seems quite large for a village suggesting that the older town would have been an important centre at one point. We follow the older alleys up towards the higher parts just under the Gavarres Hills past horta (vegetable gardens) and lemon trees. On the outskirts is more of a mix of older and more modern houses that look well-appointed for commuters to Girona, and then large masias dotted about looking over the fields around the village. Our path continues up past Mas Castell, a square built masia with a tower in the center, its stonework fully restored and golden in the sun. Around the side of the mas the path heads up into the woods and we find our first signpost. We can either continue up, or take the track marked to Juia down by the stream. We follow the path to Juia, but soon take a right hand turn up the hill on a broad forestry track. This is an area popular with mountain bikers and every so often one or two come downhill past us. 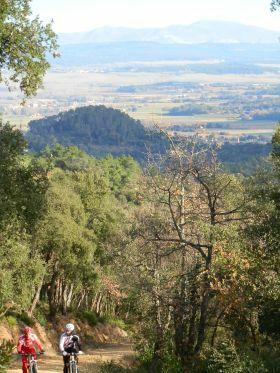 The path continues up and as we climb we can see the castle of Sant Miquel on the neighbouring ridge (see Girona walk). We continue an easy-going climb through the woods, with views back across the plain of the Ter and the factory buildings of Celra behind us. After what seems a longer time than we were expecting and almost at the top of the hill, our track joins with another broader path at a fork. We turn to the left down the track just a two mountain bikers are coming up - it seems like a long climb, but they don't seem to notice. This path will lead us down to the castle and the views are excellent, firstly out to the sea and Montgri and then across to the Pyrenees - a line of snow clearly visible, with the top of Canigo shrouded in cloud. The path takes us down the next valley from the one we walked up with the Sanctuari of Els Angels on top of the hill opposite. Close to the bottom the road takes a right hand bend and we get to the ruins of the castle of Palagret. Little more than a few walls and some arched door ways remain of the building which sits above a moat hewn out of the rocks. 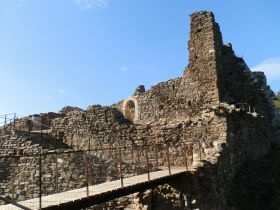 The castle is being renovated and a wooden bridge with metal handrails takes us into the main keep area. Other stairs have been added and it's possible to walk through the rooms and up to the top of the castle for the view of the valley. After a brief break we continue the last part of the downhill and on past some terraced fields and a stream close to old masias. We could walk straight back to Celra, but our planned route takes us along the Cami de Juia to the right. As we pass the last gate before returning to the woods we see what looks like a dragon's nest made from reeds wrapped around two trees obviously made for children. The path curves through the woods and then gently rolls down to the old village of Juia emerging at an imposing farmhouse with views of the church. Juia is a small village/hamlet almost all of original older stone houses nestling together along a small streamway. The path back to Celra follows the road, but is separated as a combined footpath, cyclepath and bridleway and we pass more perfectly restored farmhouses. At the outskirts of Celra we are back among more modern buildings and a number of apartment blocks as the outskirts of Celra is more modern with estate type houses. Then along past the older centre once more and back to the car.